Praslin, the second largest island in Seychelles, has a great choice of hotels, including many smaller guest houses and self-catering properties. The Just Seychelles team know all about the different choices of hotels on Praslin for your Seychelles holiday, including the best coast to be on depending on the time of year. That's our attention to detail! Browse our selection of Praslin hotels and resorts, then call us for a detailed quotation. On a hillside overlooking the ocean, with spectacular views of neighbouring islands & offering a good deal of privacy. Superb offers throughout the year including reduced rates for honeymoon and anniversary couples. Excellent accommodation in the 'traditional hotel style' of Praslin island. This popular hotel offers excellent standards of service from its friendly staff. 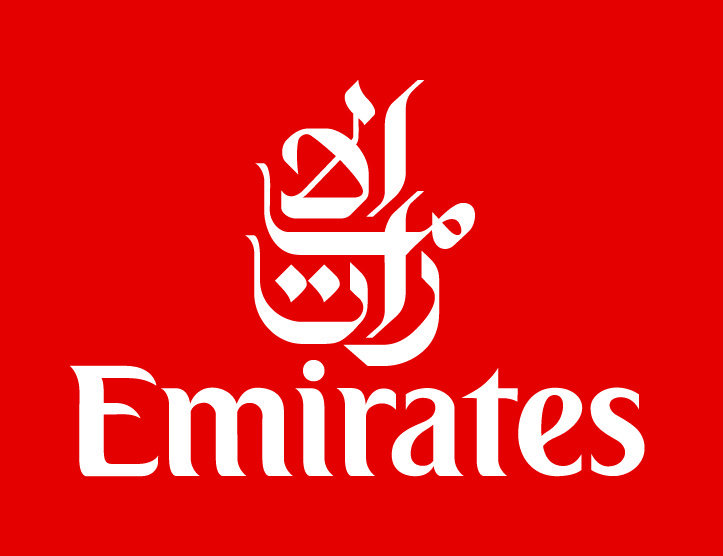 Offers including honeymoon and anniversary deals. This 5* property, the only hotel with an 18-hole championship golf course in the whole of Seychelles, is set by 3 gorgeous beaches and offers Suite & Villa accommodation. Set beside the gorgeous Cote d'Or beach, the recently built Cote d'Or Footprints are ten spacious apartments in a lovely garden setting, close to the nearby village of Anse Volbert. A 'unique' luxurious boutique hotel on Praslin's west coast at Grand Anse. 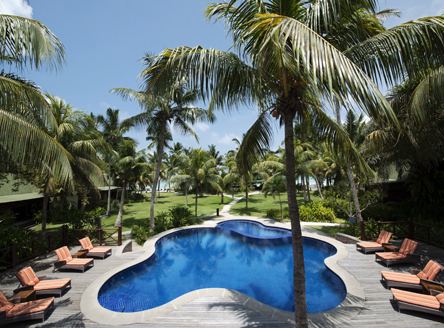 Offers just ten individually designed suites set around a central swimming pool and à la carte restaurant. Privately-owned hotel, set on a tropical hillside with stunning views over the Cote d'Or bay. Various offers throughout the year as well as Honeymoon & Anniversary deals. A superb value hotel set right beside the beach at Grande Anse on Praslin's west coast. Family-friendly and excellent accommodation. Lovely hotel set in its own picturesque private bay - perfect for honeymooners and romantics, or just for those seeking peace and tranquillity. Spacious rooms and consistently good service make Le Duc a popular hotel. Its restaurant, Cafe des Arts, is often regarded as having some of the finest Creole cuisine in Seychelles. Set in tropical gardens and right beside the beautiful Cote d'Or beach, this hotel is renowned for its friendly welcome and great value. Whether for families or couples, it's always popular with Just Seychelles clients. On a hillside on the north-east coast, overlooking Curieuse Marine Park, this 5* deluxe resort offers luxuriously appointed villas - all with private pool - as well as an award-winning Raffles Spa and excellent service. 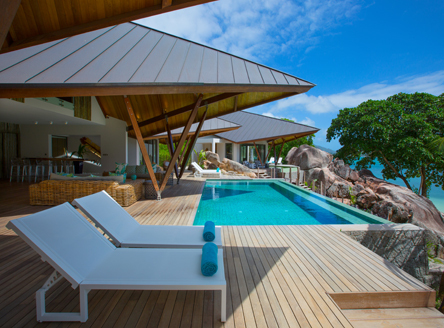 A luxury private villa on the east coast, nestled among giant Seychelles granite boulders. This sumptuous property has five bedrooms as well as a lovely private swimming pool! Small, recently refurbished 4-star hotel close to the the Cote d'Or. A great value small hotel on the west coast. Self-catering apartments beside the Cote d'Or beach. A boutique style hotel with white washed walls beside the Cote d'Or. 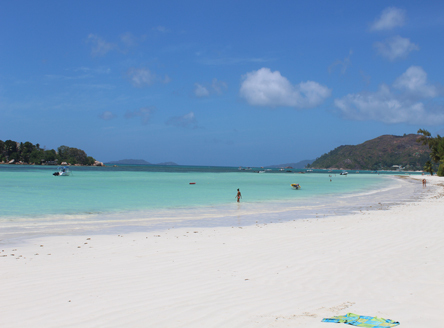 Read more about Praslin Island in Seychelles.